Founded in 1968, Packaging Design Corporation is a family owned business that strives to deliver branded custom corrugated boxes that are high-quality and innovative. Customer satisfaction is our main priority as well as creating and delivering premium quality custom corrugated boxes. We manufacture custom corrugated boxes for a multitude of industries that can be used for a variety of applications. 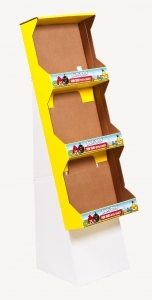 For more information on our branded custom corrugated boxes or if you have any questions on our full line of product displays and packaging boxes, call us today at 630-323-1354. You can also reach us via email at info@pack-design.com or you can simply fill out the contact form on the right and one of our knowledgeable associates will get back to you as soon as possible. Branded custom corrugated boxes are used for the creation of product packaging and display models. These boxes are compact, lightweight, and can be reused if needed. Packing Design Corporation utilizes the latest technology available to create superior quality custom corrugated boxes that are innovative and save you money. Our talented team of industry specialists are dedicated to making sure all of your needs are met in a timely fashion, while staying within the confines of your budget. Branded custom corrugated boxes are sure to draw attention to your product while boosting your brand recognition and to engage shoppers, to help you increase sales. Packaging Design Corporation has an exceptional staff that is dedicated to providing you premium quality and affordable branded custom corrugated boxes. For more information on our custom corrugated boxes, call us today at 630-323-1354. Or simply fill out the contact form on the right and we will respond shortly.